With Valentines Day almost a week away how many moms are thinking up unique treats for the little ones to hand out? Some may have started brainstorming and assembly back in January, been there done that with 4 children’s worth of classes and friends to make for. I’ve also been to the point of feeling like I’ve done it all, a few times over with the 4 kids. I remember the last of the Valentines treats the youngest boy handed out made by yours truly. One year I decided to make some of my well loved chocolate chip cookies and include the recipe card for Christmas treats, and I used it a few times through the years to be honest. It’s funny how blog posts come to mind, for me anyway. Just when I thought well I’ve got one post maybe left to share and that’s it for Valentines I was reading a fellow bloggers post with a recipe for V-day cookies and it reminded me of this idea I used. Then in passing I heard the news saying how this year is Sesame Streets 50th anniversary and bam I am designing cookie monster inspired recipe cards to share here. Cookie monster and his heart can be coloured in or left as is. 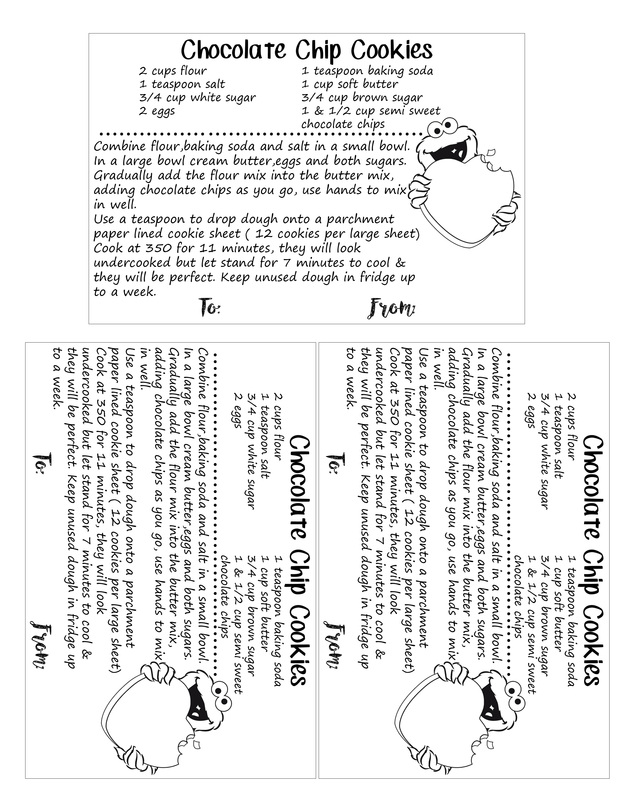 You can make some cookies like I use to, punch a hole in the top left corner of the recipe card and attach with a ribbon, or simply have your child fill in the to and from and let this be a unique Valentines card on it’s own. 4 kids – wow, you must be a cookie expert! 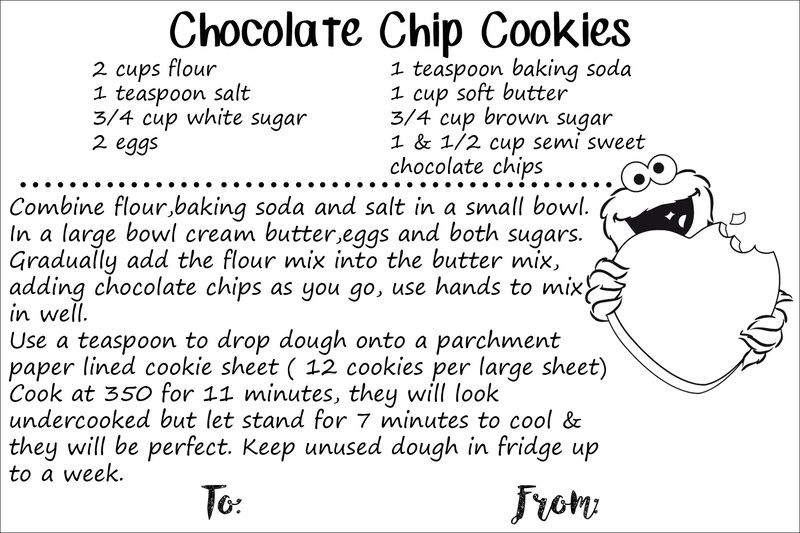 This is just fantastic idea to combine cookie monster anniversary and Valentines – who doesn’t love the cookie monster! How creative and original. That’s awesome how you set it up to be able to print off the recipe card! All the kids loved home made treats over store bought. I love cooking but baking is not my thing, i dont have a sweet tooth at all so i have perfected recipes to fit my abilities while still making a yummy treat lol. They r adults now n a preteen. 24 23 19 and 13. The older 2 on their own and i sent them off with a stack of recipe cards. Such a great idea. I always love getting something extra with Valentines cards. I loved Sesame street growing up and my kids loved the characters as well. Cookie monster was one of our favorites. Cute recipe cards! Thanks for sharing at Vintage Charm!